caterpillars and drives them to climb to the top of the plants they live on right before they die (pictured). future victims. Birds also eat the dead larvae, spreading the virus over long distances. Now, researchers have revealed how the baculovirus manipulates its hosts in the first place. Publishing online today in Biology Letters, a team shows that the virus alters the way caterpillars respond to light. larvae in the presence of light started climbing 3 days after being infected and then climbed almost 35 mm over the next 14 hours. 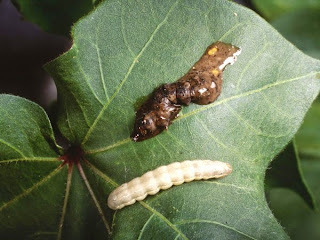 Infected larvae in complete darkness, however, did not climb as high and died at lower heights. The virus thus makes the caterpillars move toward light, which in turn triggers them to climb up their host plant and die on top.